B-Shop - The most powerful E-commerce template of 2016! Built with strong experience in e-commerce businesses. 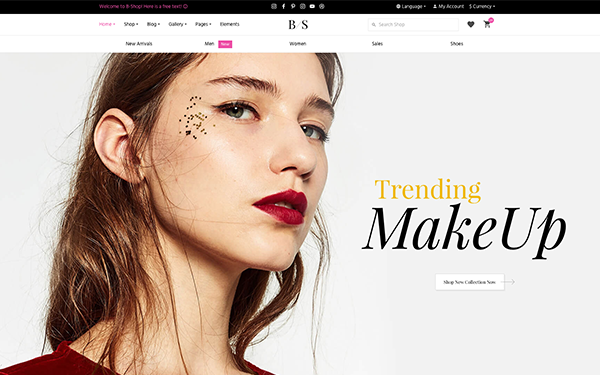 B-Shop includes 2 unique fully-functional versions: Fashion retail and Technology / Electronics online shop to leverage your site development process. New technologies, lots of customisable elements, SEO friendly code, and powerful functionality. 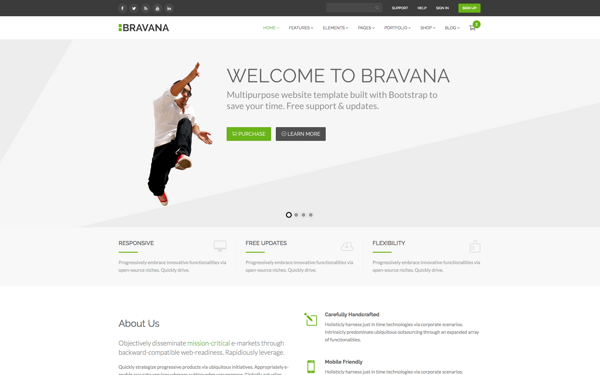 Bravana is multipurpose website template for business, agency, e-commerce or even for blogging. Beside it's full responsive, it also has a lot of features that will save your time building website (premium Slider Revolution included, you save $14). The theme is built using Sass with very well managed Sass file structure, so you can learn and customize the theme faster. Each page in the theme is handcrafted with care in terms of design and performance, such as we always include necessary jаvascript file only. Mouldifi is an extra-ordinary template developed by experts following the best practicies of UI/UX and coding standards. 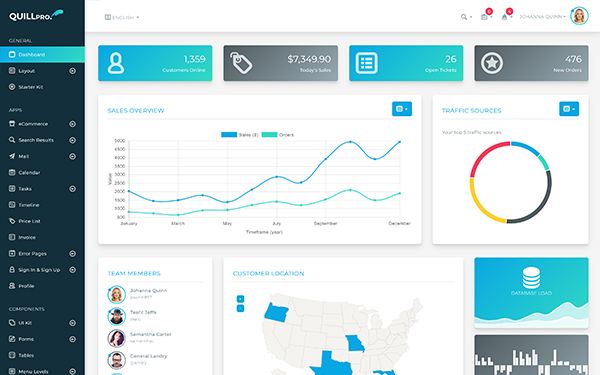 Complete Admin is a premium admin User Interface based on Bootstrap. 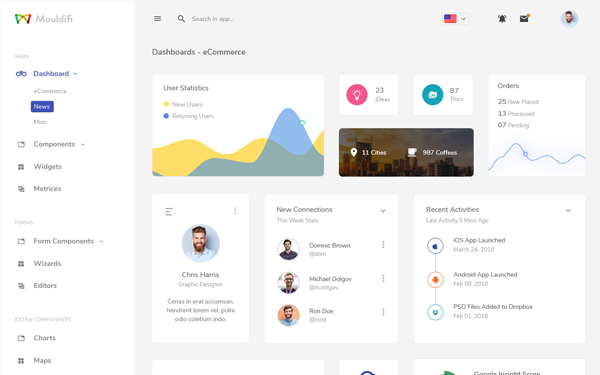 Specially designed to give your admin panel a unique and elegant look. It is easy to customize and coded in developer friendly manner. It comes with .NET MVC CORE (MVC 6 ) version, Angular Version along with HTML/CSS3/jQuery Bootstrap 4 Version and HTML/CSS3/jQuery Bootstrap 3 Version. Also it has 2 menu styles 1. Full Page Menu and 2. Fixed Menu with Inner Scroll. 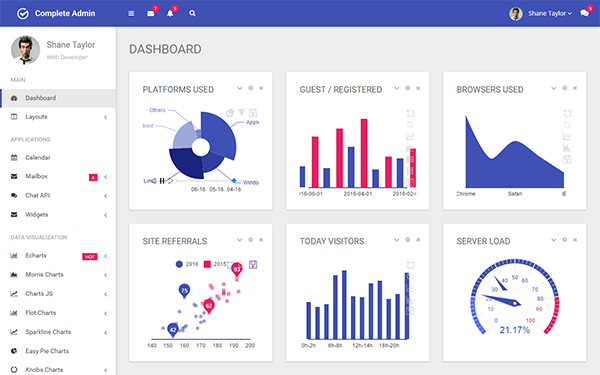 Our Bootstrap 4 Admin is the fastest way to build modern admin site or dashboardfor any browser or device. Clever Bootstrap 4 Admin Template is constantly developed and maintained by our team. The proof of this is fact that we release minimum 2 updates per month. The template is always optimized to load faster and deliver better user experience because we want to help you build profitable and scalable business. Our templates are designed by designers and coded by developers, so they offer great design and high quality clean code. 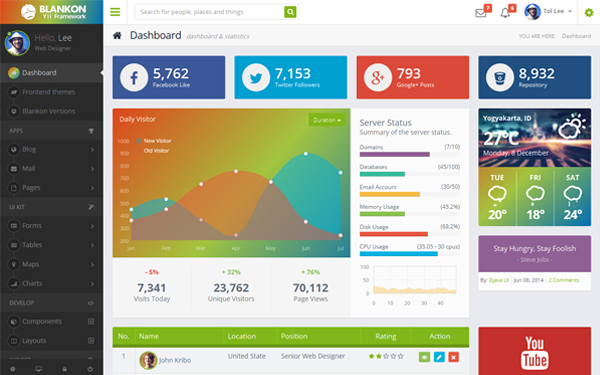 Blankon fullpack admin theme is a theme full pack admin template powered by Twitter bootstrap 3 front-end framework. Included are multiple example pages, elements styles, and jаvascript widgets to get your project started. Blankon can be used for any type of web applications: custom admin panels, admin dashboards, CMS, CRM, LESS. Blankon has a huge collection of plugins and UI components and works seamlessly on all major web browsers, tablets and phones. 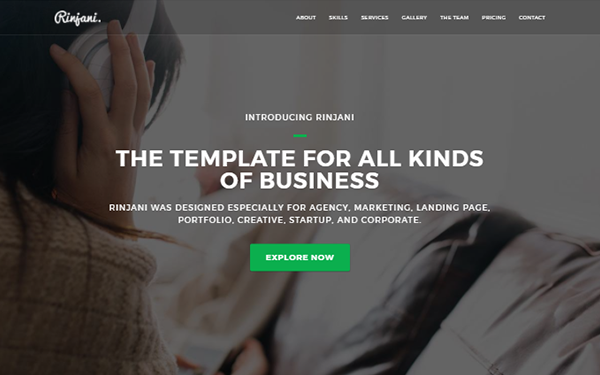 Rinjani is clean, stylish, fully responsive, and multi-purpose landing page template that has been created specifically for individual's or business agencies looking for a fresh and new design. Current release is v3.2. Buying this template now you become eligible to free download all of its future updates. 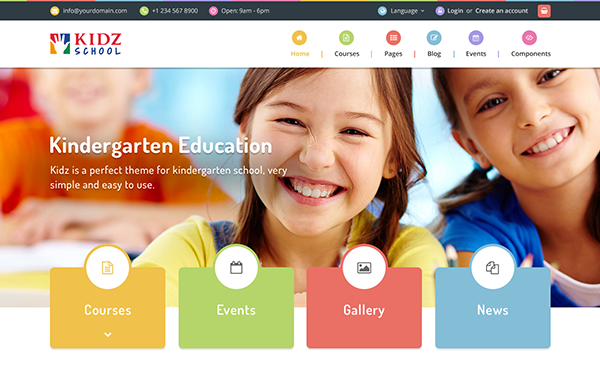 KIDZ is 100% responsive, clean and modern HTML Bootstrap Multipurpose Templatecan be used to create ecommerce, education, school, store and almost any type of website for children. Inside the package there are HTML files of all pages optimized in order to perform in a simple and fast any customization. Kidz is powered by the Bootstrap 3.3.7 Framework which is consistent across almost any device screen resolution. 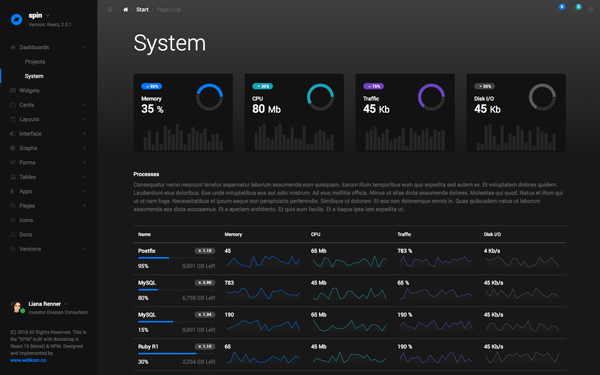 SPIN Admin/Dashboard Theme with a minimalist design and innovative Dark UI will let you build an amazing and powerful application with great UI. Perfectly designed for large scale applications, with detailed step by step documentation. It is built based on the latest standards and recommendations. It is powered by Bootstrap framework 3+, which is currently one of the most popular framework in the world. 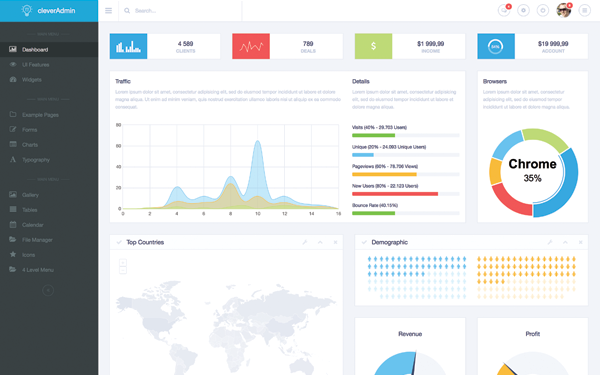 QuillPro is a multipurpose Bootstrap 4 Admin Dashboard Template that allows you build and launch your projects in the quickest time possible. We understand tight project deadlines, that is why we made QuillPro's code easy to understand and easy integrate into your projects... whether new or existing.